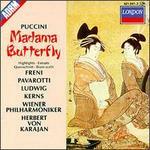 Madama Butterfly (Madame Butterfly), opera: Act 1: Dovunque al mondo...Ah! Quanto cielo! Very Good in original case. Gently used. Pasadena's finest independent new and used bookstore.